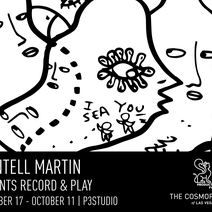 The work of Shantell Martin is a meditation of black and white lines; a language of characters, creatures and messages that invite her viewers to share a role in her creative process. Her recent work includes a solo show at the MoCADA Museum and preparation for an installation in a group show at the Brooklyn Museum (Fall 2014). She has created installations and live digital drawings at the Bata Shoe Museum in Toronto, the Museum of the Moving Image and Moma. Her first solo gallery exhibition in the Fall of 2012 sold out -- with her work featured on the Jimmy Kimmel show. Her commissions at Asia’s ultra-high end department store Lane Crawford, Y&R’s global headquarters and a custom installation for Pulse Art Fair in 2012, and again in 2014, met with the same fanfare as her hand-illustrated bedroom walls graced the cover of the New York Times home section in May 2012. She has appeared in the Wall Street Journal, GOTHAM Magazine for the launch for The Faberge Big Egg Hunt, and was spotlighted in a short film produced by The New Yorker. Her work has appeared in Creative Review Magazine, and she is still honored to have been named French Glamour’s New York’s “coolest it girl” in 2011. Martin is adjunct professor and now a fellow at the MIT Media Lab. Her studio is located in Tribeca.